If your animal is picked up and it has a rabies tag, ID tag, and/or microchip, it increases the chances of her/him being reunited with you. The Terrebonne Parish Animal Shelter scans impounded animals for a microchip in addition to checking for tags. If your pet becomes lost, immediately go to the shelter and look for your pet. DO NOT WAIT!! Bring a good picture of your pet along with you to the shelter. If your animal isn't at the shelter at that time, it may come in at a later time. Be sure to complete a Lost Report at the shelter before leaving. CHECK OFTEN at the shelter for your animal. Although our staff is dedicated to reuniting pets with their owners, remembering the face of every lost/found animal isn't always possible due to the hundreds of animals that cycle in the shelter each month. 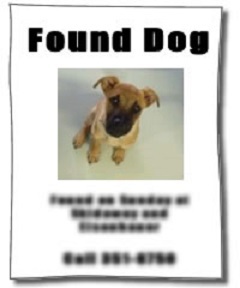 Make flyers with a good picture of your pet and multiple phone numbers. Post them in your neighborhood and at veterinary offices, pet stores, boarding/grooming facilities, animal establishments, etc. Spread the word!! Tell neighbors, friends, relatives, etc. to be on the lookout for your animal. Utilize social media outlets such as Facebook, Myspace, Twitter, etc. Also, contact the local newspaper(s) to place a free ad with a brief description (and picture) of the animal. DON'T GIVE UP!! Owners have been reunited with their animals after 6 months or more of being lost. Next, bring the animal to a veterinary office or the TPAS to have it scanned for a microchip. Making flyers of the animal and posting them around the neighborhood and at veterinary offices, pet stores, boarding/grooming facilities, animal establishments, etc. Spread the word!! Tell neighbors, friends, relatives, etc. Utilize social media outlets such as Facebook, Myspace, Twitter, etc. You should continue to actively seek the animal's rightful owner for a minimum of 14 days.